In Webster’s Dictionary, trust is defined as “the firm belief in the reliability, truth, ability, or strength of someone or something.” But while we can package the word “trust” neatly in this definition, it’s rarely so easy to determine why we are or are not trusted, why we trust someone or we don’t. Trusted leaders gain credibility through their actions, words, and deeds. Maybe that’s because trust is ultimately an emotion. We decide we trust someone after we feel that trust. Make sense? Trust is important in all areas of our lives, and the workplace is no exception. Trust is the foundation for good communication, motivation, engagement, productivity and happiness. If you’re ever been in a workplace where trust was lacking, you know how miserable it can be. So, while we all know how important trust is to ourselves and to our organizations, many of us get stuck when it comes to actually implementing strategies that will help us build trust. Recently I came across an article in Forbes magazine by Maria Gamb titled “6 Stumbling Blocks to Building That All Important Trust Factor.” In the article, Gamb says that in order to be an effective leader you must have something she calls the “KLT Factor.” Others must know you, like you, and trust you. How do you accomplish this? Through your actions, deeds, and words. If it sounds simple, it’s because it is. If you consider your group’s interest before your own, always tell the truth, and avoid unethical, immoral, or illegal actions, chances are you’ll be perceived as a leader who can be trusted. Do you have the interpersonal skills to be a trusted leader? Or is there something you may be doing that gets in the way of people trusting you? 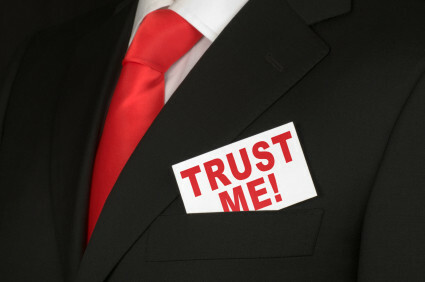 According to Gamb, there are six surefire ways people commonly erode trust. They are poor listeners. Leaders who talk more than they listen come across as uncaring, self-absorbed, and egotistic. They fail to take action. Leaders who ignore challenges and opportunities are seen as apprehensive, unable to make decisions, and ineffective. They are negative. Leaders who are focused on why things can’t be done, and not on how they can be, are simply uninspiring. They do not ask for the opinions or input of others. Leaders who fail to collaborate with or communicate with others are rarely trusted with the types of ideas that move organizations forward. They are inflexible. Leaders who practice the adage “My way or the highway” are seen as “know it alls” who aren’t worth the effort of input, ideas, and solutions. They gossip. Leaders who talk about confidential subjects, issues, or other people behind their back won’t be trusted, period. How many are you guilty of, even a little bit? What can you do to turn things around? What you may perceive as small or inconsequential improvements could have a big payoff in the trust department. Especially as a leader, simple tending to your actions, deeds, and words can build an atmosphere of trust that improves retention, engagement, productivity, and profits. For more guidance, read Gamb’s entire article about the 6 stumbling blocks to trust.